Batman and Harley Quinn comes to select cinemas nationwide for a special one-night event including a sneak peek at a Harley Quinn featurette. From an original story by animation icon Bruce Timm, comes an all-new DC Universe animated movie. Poison Ivy and Jason Woodrue (a.k.a. The Floronic Man) embark on an ecological quest to save the planet - and, unfortunately, eliminate most of humankind along the way. 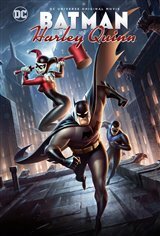 To save humanity, Batman and Nightwing are forced to enlist Harley Quinn to catch Poison Ivy, Harley's BFF and frequent partner-in-crime.